We can’t help but get excited when this time of year rolls around. With an abundance of local holiday events, you’ll always have something fun to do! Check out these exciting holiday happenings and discover a fun activity you’ll love experiencing with the whole family. If you weren’t sure that oysters and craft beer pairs well together, then think again. The 11th Annual Gulf Shores Oyster Cook-Off & Craft Beer Weekend is the perfect chance to put this theory to the test. Held November 2nd and 3rd in Gulf Shores, Alabama, enjoy live music, cooking demos, workshops, and of course – oysters and craft beer. There will also be a Bloody Mary Invitational along with an oyster shucking contest! The North American Oyster Showcase Bar will host oysters from seven regions, including the Pacific Northwest, New England, the Maritimes, British Columbia, the Mid-Atlantic, Baja Peninsula and the Gulf of Mexico. Admission is just $10 for the whole weekend, while children 12 and under get in free. Typically held in Panama City Beach, this year the 18th Annual Thunder Beach Motorcycle Rally is coming down to Pensacola Beach due to the devastating effects of Hurricane Michael. From November 8-11, scope out Casino Beach for vendors with exclusive merchandise catering to motorcycle enthusiasts while enjoying live music and great company. A kickoff party takes place on November 8th from 7-11 PM at Bamboo Willie’s. Riders will explore all Pensacola has to offer, including a tour of Historic Downtown Pensacola as well as riding out to the Naval Air Station. 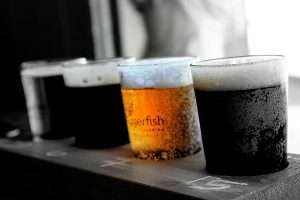 On November 10th, riders will get the chance to explore Pensacola’s breweries. Then, on November 11th, riders are able to participate in the 2018 Veteran’s Day parade in Downtown Pensacola. 100% of ticket sales go toward United Way for Hurricane Disaster Relief, specifically geared toward Bay County in Panama City. One of Orange Beach, Alabama’s premier events, you won’t want to miss out on the 2018 World Food Championships! With over 1,500 chefs and home cooks battling it out for food, fame, and fortune, it’s a weekend full of fun! The event takes place at The Wharf from November 7-11. With its first event taking place in 2012, the World Food Championships have produced over 30 TV food stars and awarded more than $1.5 million in prize money. Attendees will get the chance to check out a Yacht Club Dinner Party, teen cook-off challenge, and the 2nd Annual World Food Games. Don’t miss out! No matter whether you live in Pensacola, Perdido Key, Gulf Shores, or Orange Beach, this is a fun family event you won’t want to miss out on! The 34th Annual Frank Brown International Songwriters’ Festival runs from November 8-18 at over two-dozen venues across these four areas. Learn the stories behind some of your favorite songs directly from the individuals behind the words. Plus, some of the performers at the Songwriters’ Festival go on to become Grammy award-winning artists. Say you saw them here first! Kick off the holiday season in Destin with the 6th Annual Sparkling Wine & Holiday Lights event! Head down to The Village of Baytowne Wharf on Saturday, November 17th from 4-6 PM for an unforgettable night. Immerse yourself in the holiday spirit as you enjoy a multitude of champagnes paired with appetizers from featured area restaurants. The event rounds out with the first tree lighting of the season, followed by Baytowne Wharf’s choreographed 12 Nights of Lights show. Also in Destin, find yourself in a winter wonderland at Baytowne on Ice! The Village of Baytowne Wharf transforms into a magical ice skating extravaganza daily until February 2nd. Even if you came to the coast to get away from the snow, you can still experience this seasonal favorite! Hours for the rink vary by day, so visit BaytowneWharf.com for more information. Get into the holiday spirit with Destin’s 31st Annual Holiday on the Harbor! Watch the Destin Harbor light up with the annual boat parade as boats cruise through the East Pass in their best Christmas decor. The event kicks off with a visit from Santa Claus from 12-4 PM at HarborWalk Village’s Main Stage. Then, enjoy a special performance of The Nutcracker, presented by the Ballet Conservatory & Destin School of Music and Dance. The parade begins at 6 PM, so you’ll have plenty of time to grab some hot chocolate and cozy up before the boats come by! The event rounds out with fireworks and a fire-spinning performance from Just Add Fire. Ring in the new year at The Wharf in Orange Beach, Alabama at this fun holiday event! “Reelin’ in the New Year at The Wharf” is the annual street party held in Orange Beach on December 31st from 5PM-12PM. Say hello to 2019 in style! 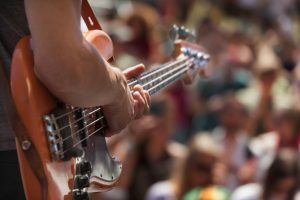 Dance the night away to live music performed by local bands. Enjoy activities for all ages, from fun for kids to adult-centered fun as well. Gather around The Wharf as the marlin drops at midnight, officially ringing in the new year! 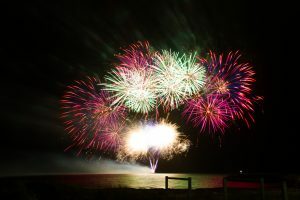 There will also be a stunning fireworks display. Resolutions start on January 1st, so let loose while you still can! Admission for “Reelin’ in the New Year at The Wharf” is free, while various activities range from $5-$10. Check out more Gulf Coast events here! We hope you enjoyed learning about local holiday events! Meanwhile, be sure to check out our rental homes in Pensacola, Destin, Alabama, and more. Thank you for being a part of the Southern family, and we’ll see you next time!